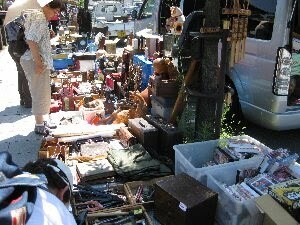 Kyoto private Guide: Flea market. We have two famous flea markets held in temples. One is called "KOBO-SAN" on 21st every month. The other is called "TENJIN-SAN" on 25th every month. The tour was on the 21st, and they wanted me to take them there. When we met, we made a plan according to their request. The first leg of the tour was Fushimi Inari. They were interested in Torii tunnel. A guardian dog of a shrine is usually something like a dog or a lion. However, in front of Fushimi Inari shrine, there are a pair of foxes. They are FOXes! not dogs. When we visit shrines, we write down our wishes on the blank side of an ema and hang it in a shrine, where it will stay until the end of the year. 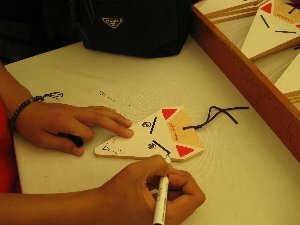 An ema is a wooden plaque. Usually a horse is painted on it. However, in this shrine, the shape of ema is a face of a fox. 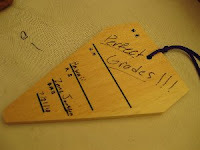 A boy of our party was urged to write his wish on it, and he wrote "Perfect grades". We tried OMOKARU stone, too. At that time, he wished "Perfect grades" again and he felt it very light. Maybe his wish will come true. He said he had imagined it very very heavy, so when he lifted it, it was not as heavy as he had imagined. This idea may lead his perfect grades! He is very smart! Surely, he will get perfect grades after coming back home! Then, the main attraction! A Flea market. Under the extremely hot weather, they surely enjoyed the flea market! Various kinds of goods are sold in this market, such as food, clothes, antiques and plants. We broke up for an hour for shopping, and they enjoyed shopping in each. After that, we went to Sanjusangendo hall and headed for Nishiki food market. They spent some time buying sweets such as candies and chocolate for souvenirs. They are from Hawaii. So, they knew very well about Japanese sweets. 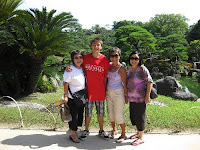 When we were in Nijo castle, our enegy was run out. We decided to go back to their hotel, and take a little rest. I said good by at this momont. Later, they went to Arashiyama to enjoy cormorant fishing with another guide. Tour ; Fushimi Inari shrine, Toji ( flea market ), Sanjusangendo temple, Nishiki food market, Nijo castle.